O… M…Goodness ! 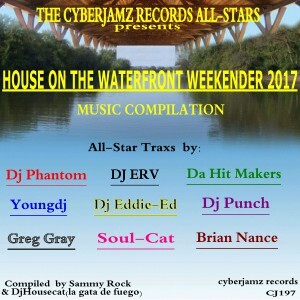 We are soooooo pleased to introduce this House on the Waterfront Music Compilation by a few of our most distinguised producers on all of our labels. I don’t know where to begin with these gems as all the pieces are unique and cover a wide-range of music from deep house to latin soul..and from afro to house,there is something for everyone. Target release date July 14,2017 – Cyberjamz Records. As many may already know we are hosting our The 2nd Annual Cyberjamz Radio™, Catherine Harris Rowell of Toupee Records/ Real Women House™ & Rescue Poetix™ Management pres: House on the Waterfront Weekender™ Friday Aug 04 to Sunday Aug 06 ,2017 in Bladensburg MD. In the spirit of giving,these guys came together and decided to pitch in by providing a track as all sales and proceeds go towards our cost for this awesome event.We truly hope you guys can go out and support us by purchasing this wonderful dance floor filled Music Compilation by our Cyberjamz /Toupee Records All-Stars. I would like to thank Walter Phant Ellison (Dj Phantom), Erving Batista (DJ ERV) , Edward Ward (Dj Eddie-Ed) , Greg Gray of the NuBang Clan , Moloko Manganyi (YoungDj) Da Hit Makers (Djtsmooth Farrar & David Barber ), Dj Punch of Baby Powder Music Ben Brisca ( BrianTech aka Brian Nance ) and finally my best friend and partner Catherine Harris Rowell ( Dj Housecat (la gata de fuego) aka SoulCat (SammyRock & DjHousecat (la gata de fuego) for participating in this wonderful project.We also would like thank YOU for the love and support of our music and labels. Invite and share this post with friends and family who you might think would like to attend our events and weekender.